Like most other Everest Region Treks, the Gokyo Lakes trek also begins with an exciting and scenic flight to Lukla, from where the real trek starts. We gradually ascent to Namche Bazaar, the capital of Sherpas and the gateway to the Everest, where we are greeted by spectacular mountain vistas. We spend an additional day in Namche Bazar acclimatizing. The following days we will pass through Dole and Machhermo where the mountain views become more spectacular. Passing through these villages we also get a chance to have a glimpse at the lifestyles of high altitude dwellers. We reach Gokyo enjoying the breathtaking beauty of the Gokyo Lakes and Ngozumba Glacier, the largest of its kind in the Himalayas. The small settlement of Gokyo lies sandwiched between the third lake in the chain of small turquoise mountain lakes and Ngozumba glacier. With its alluring side valleys, an array of turquoise lakes, Nepal’s biggest glacier and an arc of snow-capped mountains, trekking to the Gokyo Lakes is perhaps the most beautiful and extravagant in the Everest region. 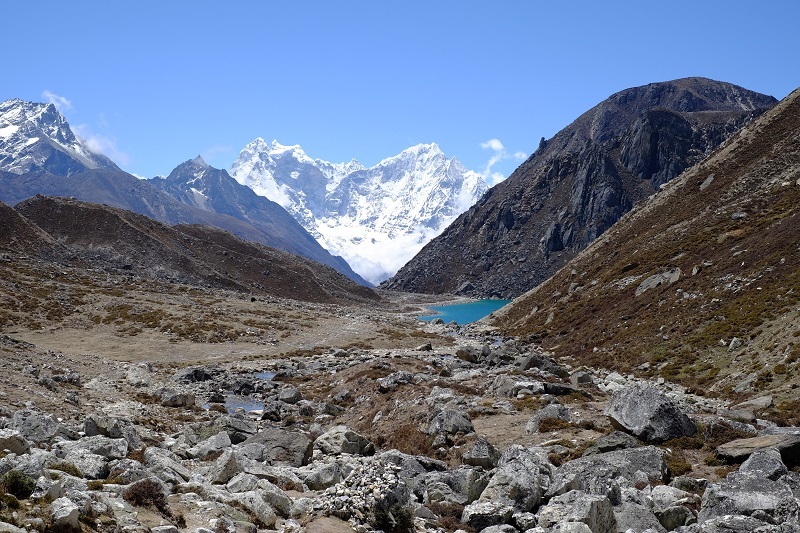 The Gokyo trek is considered as an unconventional route to the traditional Everest Base Camp and offers splendid views of the mountain peaks and the Ngozumba- the largest glacier in the whole Himalayas. One of the most amazing features of the Gokyo valley trekking is the view of marvelous ice ridge between Mt. Cho Oyu and Gyachung Kang (7952m/26080ft) and you will not miss to hike up to Gokyo Ri for magnificent view of Mt. 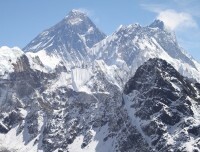 Everest and three of other eight thousanders at close range. Gokyo Ri makes a strong claim to be the best accessible viewpoint in Everest region, for not only does it offer the view of four 8000 meter peaks from its summit but seemingly dozens of 6000m+ peaks that crowd the horizon. The view down the Gokyo village, mountain lakes and the glacier is simply mesmerizing. Day 02Fly to Lukla (2800m/9184ft) and Trek to Phakding (2610m/8561ft) 35 minutes flight/ 3-4 hours trekQuite early in the morning we drive to the Airport for the 35 minute scenic flight to Lukla. Upon arriving at Lukla, we meet our crew members and begin packing and arranging with them. The mountainous landscape becomes quite prominent and the air carries a crisp freshness. From Lukla, the trekking trail slowly moves towards the Cheplung Village. From there, a gradual walk downwards leads to the village of Phakding. The terrain is amazing and offers fascinating views including Khumbila and Kusum Kangaru. The village of Phakding lies in the Dudh Koshi valley north of Lukla which has a bunch of lodges, restaurants and colorful shops. Day 03Trek from Phakding to Namche Bazaar (3440m/11283ft) 5-6 hoursWe continue trekking along the Dudh Kosi, crossing the majestic river a few times on thrilling suspension bridges decorated with colorful prayer flags. After entering the Sagamartha National Park, the trail climbs steeply with breathtaking views. Namche Bazaar is the Gateway to Everest with many hotels & lodges, restaurants, interesting shops, cyber cafes, bars and bakeries. Day 04Acclimatization Day in Namche Bazar/ Day HikeWe spend an extra night in Namche Bazaar in order to acclimatize. Today, we trek a short distance to the National Park Visitor's Center located atop the town with breathtaking views to the mountains and down the valley. After that we hike up to the Everest View Hotel, one of the highest-placed hotels in the world with oxygenated rooms. From this point, we can see rewarding views of the Himalayas including the almighty Mount Everest. Day 05Namche Bazar to Dole (4090m/13415ft) 5-6 hoursThe trail is easy in the begining up to Kyangjuma then climbs steeply out of the valley through rhododendron forests, which give way to fragrant stands of juniper and large conifers as the elevation increases. We ascend Mong La and then head downward to Phortse Thanga, where we stop for lunch. We follow the path upwards through woods of rhododendron and emerge to a perfect view of Cho Oyu. This trek is especially beautiful in spring when the rhododendrons are blooming. The trail pass through many Kharkas - the summer settlements used when Sherpas bring herds of yaks to graze in these high pastures. It's a relatively simple afternoon walk to Dole - a small village adorned with a handful of tea-houses, which used to be a yak pasture. The views of Khumbila and Tawache are incredible throughout the day. Day 06Dole to Machhermo (4410m/14465ft) 4-5 hoursToday's hike is short and pleasant, one that we can savor and enjoy. We're trying to take our acclimatization easily, so we don’t overtax ourselves with really pushing it at this point. The day starts with a climb over Dole via a scenic ridge. Crossing yak pastures and tiny villages of stones huts, we reach Luza. We follow our trail along a valley high over the river, crossing sandy spurs and pastures bordered with a chorten and prayer flags to gain Machhermo by midday with enough time to visit the Himalayan Rescue Association and get some well-needed rest. Here in Machhermo, in 1974 that Yeti killed three yaks and attacked a Sherpa woman. This is the most credit yeti incident ever reported. Day 07Machhermo to Gokyo (4750m/15580ft) 4-5 hoursOver the ridge we go, starting our day with fantastic views of the valley to Kangtega and the northern part of Cho Oyu. It's another relatively short climbing day, with steep trails making up for fewer hours. We’ll descend towards the river bank and then begin the climb towards the terminal moraine of the Ngozumpa glacier through an ablation valley formed by melting ice. A succession of cairns now marks the route through a stony landscape, with a small tarn -Mountain Lake- on the left. The valley now broadens and the trail reaches a second larger tarn Taboche Tsho. Beyond this point the trail passes through a narrower section of the ablation valley and comes to a third tarn Dudh Pokhari, with prayer flags on its eastern shore. We pause to appreciate the view before trekking another hour to the village of Gokyo, located on the edge of the third lake. Day 08Climb Gokyo Ri (5357m/17570ft) and hike to fifth lakes: 7-9 hoursWe spend another day in Gokyo to acclimatize to the high altitude. If the weather is good, we climb Gokyo Ri today. 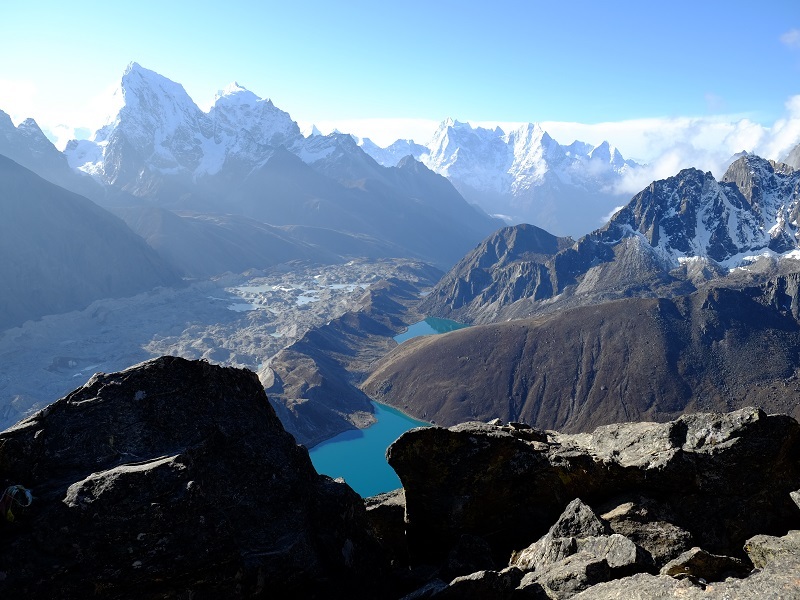 From the top of Gokyo Ri we admire the Himalayan vista and the tranquil Gokyo lakes. We also hike to the fourth and the fifth Gokyo lakes. 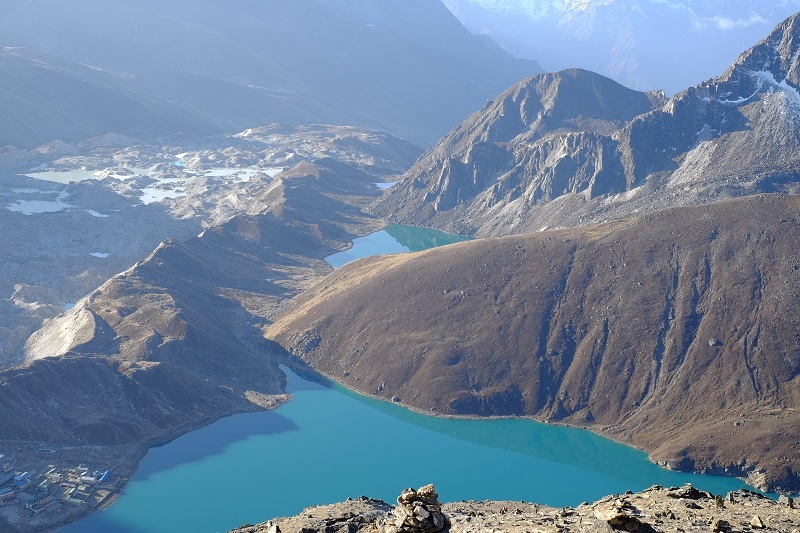 The 4th lake is only about 3km north of Gokyo. It is marked by high cliffs and Himalayan peaks rising above it. We continue to walking a little further and reach the 5th lake. A climb up a nearby hill will guarantee us remarkable views of Cho-Oyu, Gyachung Kang, Everest, Lhotse, Nuptse, and Makulu. We can see a lot more from here - the spot is called Scoundrel's Viewpoint. From the northern part of the 5th lake we see the Cho Oyu base camp and Ngazumpa Glacier which is the biggest glacier in the world. We walk back to Gokyo to spend the night. Day 09Gokyo to Dole (4090m/13415ft) 5-6 hoursWe descend on a trail along the Dudh Koshi River and pass the first Gokyo lakes. On the way we also enjoy views of the Cholatse and Taboche peaks. Our trail descends before climbing a hill. After reaching the chorten at the edge, we see great views of Thamserku, Cho Oyu, and Kangtega mountains. We walk past Machhermo, Luza and Lhafarma villages before reaching Dole. Day 10Dole to Namche Bazaar (3440m/11283ft) 5-6 hours We descend on a steep trail to Phortse Thanga admiring rhododendrons, wildflowers and waterfalls. We also come across mountain goats, musk deer, pheasants, etc. From Mong La, we can admire a good view of Khumbila peak. On our way to Namche the view of Taboche, Ama Dablam, Thamserku and Kangtega mountains are ours to admire. After walking for a while, we reach an intersection where the trail from Sanasa meets our trail. We walk on a trail that clings to a forested slope beyond Kyangjuma, winding through several bends. Namche Bazar is only about an hours trek from here. Day 11Namche Bazar to Lukla (2800m/9184ft) 6-7 hoursThe trail descends steeply downward so we need to walk cautiously as our shaky legs continuously battle the rocky terrain. After crossing the suspension bridges over the fast flowing Dudh Koshi and its tributaries, the trail becomes more level and natural. After our arrival in Lukla, we stretch those sore legs and recall the experiences of the last couple of weeks. In the evening, have a few celebratory drinks and dance with your trek mates. Day 12Fly back to Kathmandu (1335m/4379ft) 35 minutes flightWe catch an early morning flight to Kathmandu after our long mountain journey. After reaching Kathmandu, we can take a rest or do some souvenir shopping. If we want to explore any other areas of Kathmandu, we may do that today. Our guides can help you with both souvenir shopping or sightseeing. There will be a farewell dinner with Nepalese cultural program in the evening to celebrate the successful completion of our journey. Day 13Kathmandu valley sightseeing/ UNESCO World Heritage SitesToday, we will visit three spots in Kathmandu valley of historical, cultural and religious importance which are also the UNESCO Wolrd Heritage Sites. We first visit Kathmandu Durbar Square, and observe old palaces, beautiful temples and have a quick glimpse of the Living Goddess “Kumari.” After exploring the historical, religious and cultural center on Kathmandu we will take short drive of about 20 minutes to the Swoyambhunath Stupa, which is popularly known as the Monkey’s Temple as many hundreds of monkeys hang around the temple and amuse the visitors. Monkey’s Temple is situated atop a hill which is believed to have self-existed and its hill top location provides great view down the city and also the Himalayas in a clear day. Then, we drive to another ancient town of Patan and explore its people and their art, culture, tradition and lifestyle. Observing beautifully decorated age old temples and monasteries, we may also have a chance to have a personal audience with the Patan Kumari (Living Goddess). Patan is famous for its temples, fine arts, metal works, stone & wood carvings. We can witness local artists working on their workshops. Patan used to be separate kingdom from Kathmandu and Bhaktapur and different kings ruled this ancient city until the 17th century. There has been little damages at the above sites by the recent earthquake but still beautiful and definitely worth a visit. The renovation is going on most of these sites. Day 14Drop to the airport for farewell and departure or extend the trip with other activitiesYour adventure in Nepal comes to an end today! A representative from Authentic Adventures will drive you to the airport approximately 3 hours before your outbound flight. On your way home you'll have plenty of time to plan your next adventure in the wonderful country of Nepal. 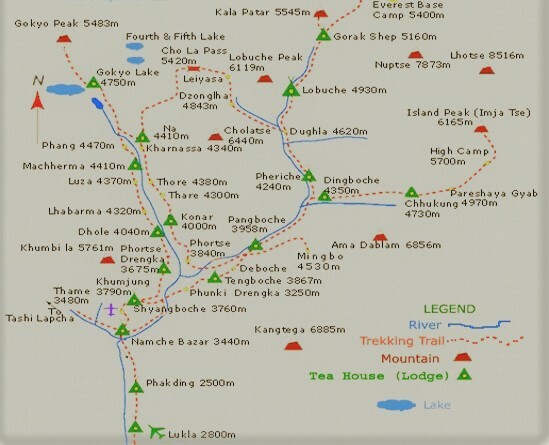 You will be accommodated in a 3-4 star hotel in Kathmandu and mountain lodge/tea-houses during the trek. All accommodations are on twin-sharing basis. Single supplement will be served on request and will cost an additional US$ 175. Authentic Adventures will arrange rooms with attached washrooms when possible; however, mountail lodges/teahouses in some places only have shared washing and toilet facilities. Also note that single rooms are readily available in Kathmandu and the trekking regions at lower elevation but it might be difficult to find them at higher elevations during peak trekking season. 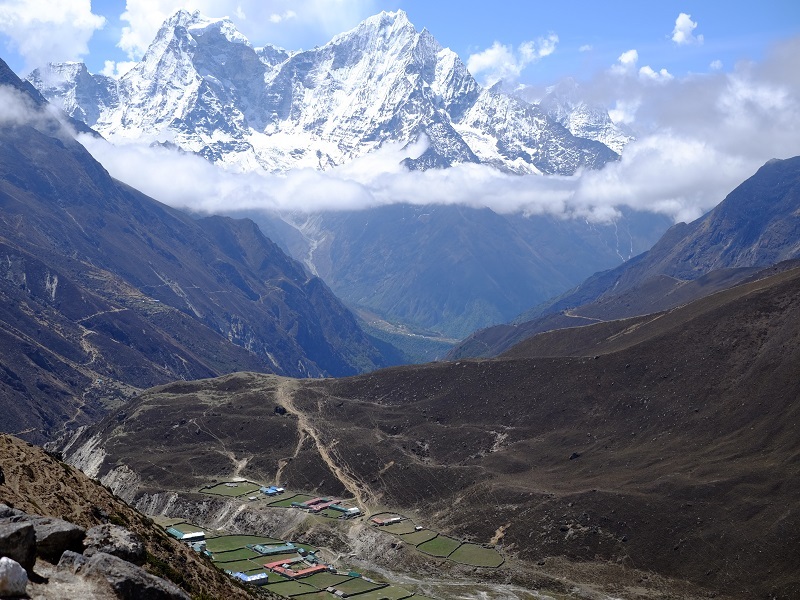 Everest Base Camp Trek is a moderate to strenous trek suitable for passionate walkers who have the ability to walk at least 5 to 7 hours a day with a light rucksack. In some days we might even need to walk for 7 to 8 hours. Walking in higher altitude is more physically demanding than walking in the lower altitudes; however, if we are in excellent health with average physical fitness, have a positive attitude and strong determination, we can accomplish the trek successfully. Exercising and jogging regularly is good idea to enhance our strength and stability. Past hiking experience would be an asset but no technical skill is required for this trip. Participants with pre-existing medical conditions such as heart, lung and blood diseases should inform Authentic Adventures before booking the trek. We also recommend that you consult your doctor before the trip. Spring (March to May) and Autumn (October and November) are the best months for this trip. Although this trip can be done throughout the year. However, during winter, the cold temperature might not be suitable for everyone and during monsoon, the trails are a bit wet and the views are not always clear. The Kathmandu-Lukla-Kathmandu flights are very sensitive to the weather conditions. Such conditions may arise even in the best trek seasons. Hence, in such cases, you must be prepared for long waits either at Kathmandu or Lukla airports. We can organize Helicopter shuttles in such conditions with some extra charge, if it is available and the weather is okay for that. The helicopter charges around US$ 3500 and it can lift 4-5 persons per flight.